I read something dumbfounding today. You could say it was founded on dumb. On first inspection, John Ibbitson’s article in Saturday’s Globe and Mail (“Core support keeps the PM in thrall”) is an ordinary, forgettable opinion piece that uses the recent silliness over the lyrics to the national anthem as a springboard for restating the obvious: the Conservatives can’t win a majority because every time they’re close, the mythical Republican-style rabble-rousers lying in ambush in the tall grass of the Alberta prairie celebrate with a premature volley from their unregistered firearms, and the rest of the country begins to have second thoughts about whether letting them win is a good idea. Never mind the questionable statistical basis for linking one issue to the other. This isn’t news to anyone who follows Canadian politics in a sound state of mind, nor is Ibbitson’s sensible identification of the Tory core as moderate centrists (however incongruent that may be with partisan caricatures from both the left and right). There’s nothing here to see. The great political irony for the Conservative Party is that, while it must avoid estranging core conservatives at all costs, extreme core conservatives keep the party from winning a majority. They are the social Darwins. Most of the time, these right-wing nuts are ignored. But whenever Mr. Harper appears to have enough support to form a majority government, the base starts to get excited and aggressive, and social Darwins “bare their teeth and embrace things that the majority of Canadians don’t want to see,” says Mr. Turcotte. This frightens enough centrists to keep the Liberals in the game and the Conservatives confined to minority governments. 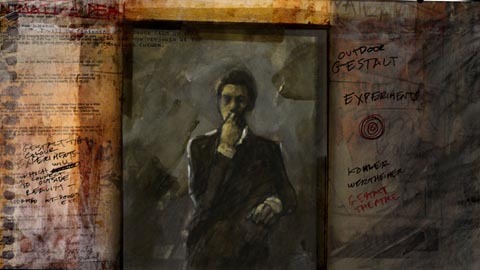 For those of you who are unaware, I am presently writing from what must surely be the Darwin capital of the world. It’s wall-to-wall Darwin here. 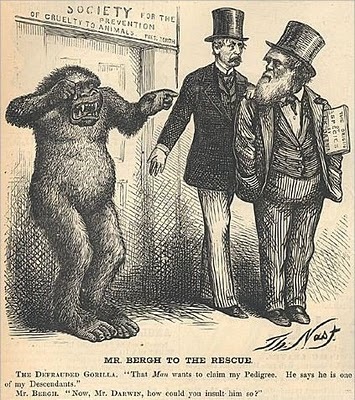 All year long I have bathed in the most glorious talk of the literary Darwin, the proto-feminist Darwin, the abolitionist Darwin, the invalid Darwin, the patriarchal Darwin, the imperialist Darwin, the epistemological Darwin, the analogical Darwin, the cultural Darwin, the impressionist Darwin, and Quentin Blake’s cartoon Darwin. I am a stone’s throw away from Darwin’s letters, Darwin’s Plots and the Darwin College bar. I’ve seen the poor fellow’s name used and abused in every imaginable way. 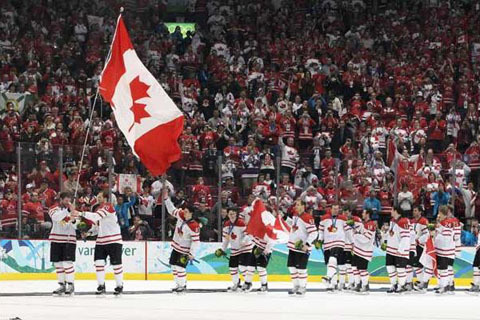 Time will tell what I remember of the Vancouver Winter Olympics decades from now: not much in the way of specifics, I expect, but a lingering oddness of having missed the biggest national celebration in my country’s recent history on account of being overseas. On face it was an Olympics like any other: foreign, inconveniently scheduled, and mediated by coverage that was indifferent at best and infamously vicious at worst. Several of my compatriots took to the keyboards, composing paeans to the full bloom of maples metaphorical, declaring the fortnight as a whole (but the men’s gold medal hockey game in particular) a milestone of national pride for a country where the very idea of identity is a bit of a running joke. The statistics back this up: in an age where popular media has splintered and television has declined as a central force, to be the most-watched broadcast in Canadian history is no small feat. To say this will remain a defining moment in the country’s perpetual quest to come to terms with itself is to make a self-fulfilling prophecy: over two-thirds of active Canadian history textbook authors are likely to have watched the game (and probably more, if we suppose this demographic to be of a more patriotic bent than the mean). Comparisons to the Paul Henderson goal of 1972 can hardly avoid cementing themselves as fair, only this time we have victories in thirteen other competitions and a global audience in the mix. The sheer neatness of the narrative should have us scratching our heads and running background checks on the referees to uncover scandalous past careers as European ice-dancing judges. Come to think of it, I should have known we were in for a Canadafest of unprecedented proportions when I caught the last half-hour of the opening ceremonies, at approximately the mark where the ever-undercapitalized k.d. lang broke the standing moratorium on Leonard Cohen’s “Hallelujah”. And yet it is striking to think how little of Canada as we know it now, how few of our quaint clichés of public exhibition, were around for the Calgary Olympics in 1988. The ink hadn’t dried on the Constitution Act, national unity was far from a given, and we hadn’t even reached the point where Céline Dion was considered a good idea, let alone a bad one. This I do know about the Calgary Olympics: it created the entire sporting infrastructure of the city as I knew it growing up and as we continue to know it today. For citizens of my generation to imagine a Calgary before the Olympics is borderline impossible, and the spirit it injected into the civic culture, all too easy to take for granted in the ahistorical mist of youth, was in retrospect a full-fledged metamorphosis. For all the objections to the Vancouver games and uncertainties over whether it was money well spent, the legacy of its spillover benefits will course through the city for decades to come. There is value in being world-class. It doesn’t matter if you contrive to suspend Parliament for months to secure yourself a once-in-a-lifetime seat next to Wayne Gretzky or celebrate in your ivory tower over a bottle of ink and a sheaf of parchment addressed to a newspaper that likes you; you can appreciate it all the same—yes, even if you’re in the UK. 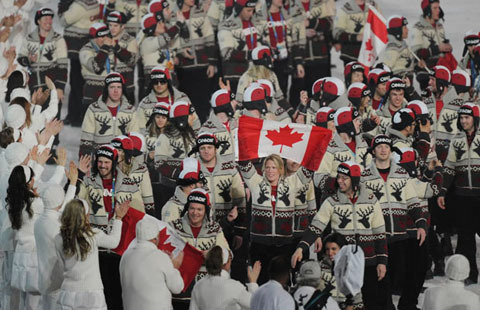 I missed most of the live broadcast of the opening ceremony of the Vancouver Winter Olympics, but from what I saw it was quite the Canada-fest. Someone should look into how it compares to the way Calgary presented the country in 1988. As someone who grew up in Calgary in the decade following the Olympics, I can attest that it had a permanent transformative effect on the city and its sporting culture, and its legacy can still be felt there today. But let’s begin with some links. I read up on much of what I missed via this article by Paul Wells, who saw the opening from inside GM Place. Jonathon Narvey and Adrian MacNair made photographic excursions to capture the early protests, which they described as scattered in a plurality of marginally coherent agendas; that was before things turned violent. For an alternative look at the political counter-programming, my friend and former schoolmate Meera Bai visited the Poverty Olympics in the Downtown Eastside. The political dimension of the Olympics doesn’t interest me all that much, to be honest, but the stories and pictures are flavourful. Kevin Brown of Geographicus wrote a comprehensive introduction to authenticating rare and antique maps—a must-read for the cartographically inclined. And while on the subject of maps, Google incorporated aerial images from World War II into Google Earth. Roger Ebert took a mental walk around London. Like most of the personal recollections Mr Ebert has put in writing of late, it’s a beautiful piece—and near the end he comes by my present stomping grounds in Cambridge and Grantchester. Terrence Deacon raises some problems with the theory that language is a product of natural selection. When David Ben-Gurion was Prime Minister of Israel, he considered Albert Einstein for President. Einstein declined. You didn’t seriously expect me to let this pass without comment? Were this a political blog, I would have little to add to the obvious analysis that every national publication promptly shoved out the door. Nobody knows what to do with this, yet everybody knows what to do with this because there isn’t that much to debate. Say, wasn’t that rather good? Aren’t the lyrics ironic in light of Conservative policy? Didn’t the Prime Minister previously criticize this sort of arts gala as too removed from public concern? Is this a gift-horse for the artsy-fartsy elites or a populist slap in the face? And isn’t Michael Ignatieff ever in trouble when all he has to his name is a tour of duty as a BBC culture personality in the 1980s (which carries a lot of weight with me, as you can probably guess)? Colour me bored. The one refreshing piece of journalism in all this is this human-interest story in The Globe and Mail about how Laureen Harper arranged the gig—and I call it refreshing not least because it’s, you know, The Globe and Mail. We can ask ourselves if this was an “honest” move or a shrewd grab for political advantage (as if the two were mutually exclusive!) until we are blue in the face. But this is not a political blog, and what Mr Harper’s performance says about politics is a good deal less interesting to me than what it says about music.